An ingenious idea. The biggest tanker the world has ever seen, gorged with toxic crude oil, is aground off Alaska. What to do? The pace is fast, the technology accurate and not too much. A good read. In the Bering Sea, Bennkah, the largest oil tanker ever built, newly commissioned in Vladivostok, Russia, is on its maiden voyage. Well respected Captain Nicholas Borodin is at the helm, and for a reason only he knows, his agitation is palpable. Soon an engineer discovers a defect—seemingly minor, but one with disastrous potential. Despite his attempts to correct the problem, a fire erupts, contained at first, then rapidly spreads out of control, consuming the behemoth tanker. A Mayday call alerts Captain Sonny Wade some two hundred miles from the burning ship. This could be the lifeline that Sonny and his rag-tag crew need to save their failing salvage business. But Dal Sharpe, Sonny’s nemesis and former employer—the owner of the largest salvage business in all of the northwest—also hears the call. A heart stopping race is on to claim the hulk before it contaminates the entire north Pacific Rim. But Sonny learns there’s more at stake than anyone realizes—a catastrophe of monstrous proportions. "From the opening scene, it's clear you’re in the hands of authors who call the ocean, and seafaring ships, home. Characters are well-defined, descriptions are vivid, and the story feels genuine. 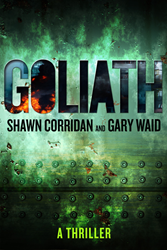 Goliath is a terrific opening act for Corridan’s and Waid's crew, with undoubtedly many exciting adventures to come." Shawn Corridan and Gary Waid were raised along the sunny waterways of Florida’s east coast where they spent their youth surfing, fishing, motor-boating and sailing. Corridan and Waid lived their formative years in Merritt Island and Cocoa Beach, sleepy coastal hamlets inhabited by drug smugglers, shrimpers, surfers, strippers, rednecks and rocket scientists. NASA Moon launches could be seen from their backyards. After graduating from Merritt Island High, they went their separate ways, recently reconnecting to write Goliath and several other suspense novels. Gary currently lives aboard a sailboat in Cape Canaveral and Shawn divides his time between Merritt Island, Hollywood and Honolulu.